I’ve emailed you my T4 & T22. What next? We will contact you by email or phone within 24 hours to ask a couple of short questions about your tax return and status, allowing us to work out the best return for you. Then we will provide your tax return quote, and if you aren’t 100% happy and do not wish to submit, then no problemo – you won’t have paid a thing! Upon your approval, we will submit the tax return electronically and the funds will appear in your bank account after CRA have processed the application. All that is left to do is to send us the tax return cost and you’re done. Who said tax had to be taxing? 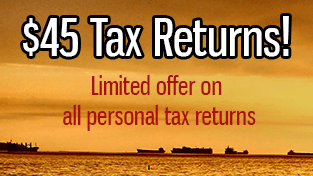 For a limited time enjoy our $45 tax return.